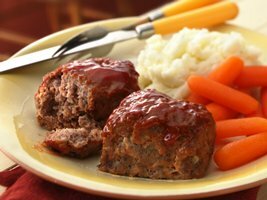 While the mixture of ground beef and pork gives these little loaves a unique flavor, you can also use 1 1/2 pounds of ground beef instead of the mixture. Serve these loaves alongside cooked baby-cut carrots and mashed potatoes. Apple or cherry crisp is a sweet way to end the meal. 1 Serving (1 Serving)Calories 300(Calories from Fat 140),Total Fat 16g(Saturated Fat 6g,Trans Fat 1g),Cholesterol 105mg;Sodium 440mg;Total Carbohydrate 17g(Dietary Fiber 0g,Sugars 11g),Protein 22g;Percent Daily Value*:Vitamin A 8%;Vitamin C 4%;Calcium 4%;Iron 15%;Exchanges:1 Starch;0 Fruit;0 Other Carbohydrate;0 Skim Milk;0 Low-Fat Milk;0 Milk;0 Vegetable;0 Very Lean Meat;0 Lean Meat;0 High-Fat Meat;1/2 Fat;Carbohydrate Choices:1;*Percent Daily Values are based on a 2,000 calorie diet.